Backed by a team of experts, we specialize in manufacturing and supplying BOPP Tapes that are widely acclaimed for its numerous features. 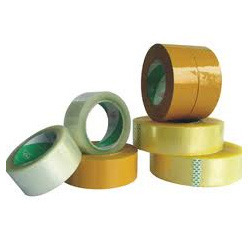 We offer BOPP tapes in width of 12 mm, 18 mm, 24 mm, 36 mm, 48 mm, 60 mm & 72 mm and length of 65 m & 650 m. The offered range is widely used for various packaging purposes. - It is a Bi-axially oriented polypropylene film coated with water based adhesive. - Printing of single and multiple colors is also pssible with logo or customized design. - Printed with company logo, it is a self-promotion display platform for enterprise. - It is very good for carton box sealing and for stationery purpose. Film has outstanding flatness & one side corona Treated (TI/TO) Because of outstanding flatnes, this film has wide application as textile bags & Pressure sensitive adhesive tape. 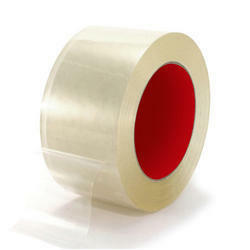 We are engaged in providing Self Adhesive BOPP Tapes. The Bi axially oriented Polypropylene film has superior adhesive, which is applied by the latest state-of-the-art-coating machine. These tapes are manufactured using premium quality bi-axially oriented polypropylene and have water and temperature resistant acrylic adhesive that provides strength and holding power. We are leading manufacturer of BOPP Tape. Bopp Self Adhesive Tapes : Our extensive domain expertise assist us in manufacturing a wide range of BOPP self adhesive tapes. These can be used for binding, packing and adhesion applications and mainly used for packing of boxes & internal packing purposes.